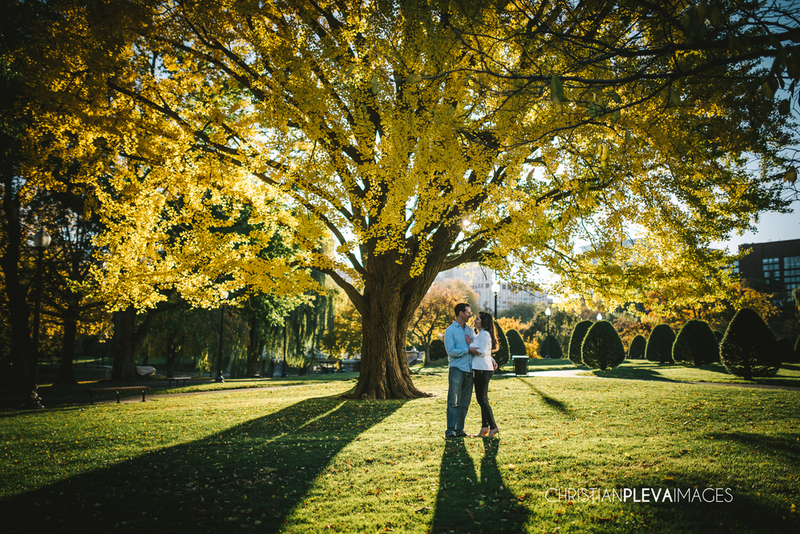 I had a great time getting to know and hang out with Shagha and Mark during our shoot in the Boston Public Gardens. We met at sunrise to get fantastic morning light and be able to visit the very popular Public Gardens with very few people. Here is a little bit about this wonderul couple in their own words... Then a sneak peek to hold them over until they see the rest! Our first date was over brunch at 75 Chestnut in Beacon Hill. Walking up to the restaurant, Shagha saw Mark from a distance and could immediately feel the butterflies. Mark, distracted by his phone, had no idea what was in store. Little did we know that this would be the frequent start to all our stories - Shagha, perpetually a few minutes late, and Mark, always on his phone. We were away for a weekend with Mark's family in Rangeley, Maine, where Mark spent a lot of time as a child. Our first night there, Mark's mother suggested that we all go up to the mountaintop before dinner to catch the view. Little did Shagha know this was all a carefully planned ploy by Mark to get her up there for sunset. When we got to the top, Shagha realized Mark's family was nowhere to be seen. By the time she turned around, Mark was down on one knee. There, against the backdrop of the sunset over the Rangeley lakes, Mark popped the question and Shagha said "yes!" Shagha's first call was to her parents, who knew what Mark had in store, and the couple was joined by Mark's family 10 minutes later. Needless to say, the rest of the weekend was full of champagne and joy. Mark was going for Zoolander and Shagha was going for Gisele. As a plan B, we just wanted to capture the little things - how Mark is always making Shagha laugh, the look Shagha gives Mark when he's gone too far, how we love the beautiful city of Boston, and how excited we are for the next phase of our lives. Both of us can be pretty silly and we really wanted a little artistic flair beyond just the "say cheese" type posed photos, so we knew Christian was perfect for us after seeing his work online. Yes - wear comfortable shoes! As pretty as Boston's cobblestone streets are, they are not too friendly with a pair of stilettos. Aside from that, just relax and have a good time. We are looking forward to seeing our joy and love come through in these photographs. It was great. Christian was so generous with his time and just made us feel so at ease - like we were hanging out with a friend who just happened to be taking pictures of us. It's a shame he's already booked on our wedding date - we would totally use him again.